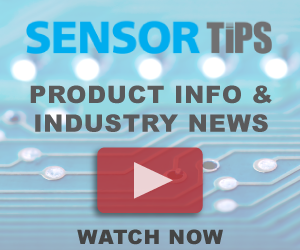 At Sensors Expo 2018, Faheem Faheem, the Director of R&D for Visionix Engineering for Thales Visionix, discusses NavChip 2, a next-generation inertial measurement unit (IMU) with high sensitivity and high performance. Architected around proprietary technologies and advanced signal processing techniques, the IMU contains a microelectromechanical systems (MEMS) 3-axis accelerometer and 3-axis gyroscope for 6-axis motion sensing. The 12.5 x 24.5 x 5.4-mm IMU weighs 3 grams and can provide about 250 Hz bandwidth for both angular and linear acceleration. It works with standard SPI or UART data output interfaces. Recording x, y and z-motion, the IMU can even detect tapping on the tabletop. For a detailed analysis of the NavChip performance, the NavChip evaluation kit comes with all of the equipment necessary to interface the NavChip to a host processor, through either a USB or RS-422 interconnect and includes a NavChip, a NavChip adapter board, a USB cable and software tools. The company’s next generation controller will provide a 1000 Hz output with UART, SPI and I2C output capability. Combined with a Kalmann filter, the IS-1500 Vision-Inertial Tracking System can be mounted on a helmet for applications that include drone monitoring or industrial robotics or in navigation systems. It has been used in military and commercial aircraft systems for mixed reality and GPS-denied navigation. With its small size and lightweight, the user-friendly optical-inertial device allows tracking of an object or person in any environment from a mobile computing platform. With its high precision (2 mm (typical) position accuracy), it is highly suitable for augmented reality and robotic navigation applications.